Another super tournament got added to the chess calendar and will be held from 9 to 15 September in St. Louis. 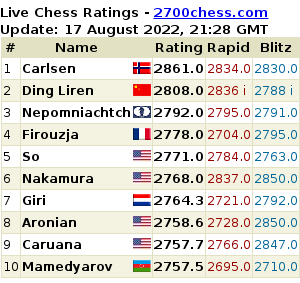 Leaders of the world rating list Magnus Carlsen and Levon Aronian, as well as leading U.S. players Hikaru Nakamura and Gata Kamsky will face each other. The four grandmasters will play the classic control in double round robin format. The tournament carries the name "Sinquefield Cup" in honour of the founder of the Chess Club and Scholastic Centre in St. Louis, Rex Sinquefield (photo). Over the last four years, the businessman has consistently received a special award from the U.S. Chess Federation for his outstanding contribution to the development of chess in America. The prize fund of the competition is 170 thousand dollars. The second Sinquefield Cup which will be held from August 27 to September 7 announces the field. Double round-robin Sinquefield Cup is underway in St. Louis. Follow the 4th round games live. Magnus Carlsen will decide to play the World championship match or not only after the Sinquefield Cup which is approximately September 8. This has been reported by nrk.no with the reference to Espen Agdestein, Magnus's manager. Levon Aronian and Hikaru Nakamura are to play a five-days match from November 21st to November 25th in the U.S. city of Saint Louis. The event will consist of four classical games (1 per day) and the blitz match of 16 games in the final day. The prize fund is $100.000, which is the same amount as in the Tal Memorial Blitz finished in Sochi a few days ago. The winner of the Sinquefield Cup will be determined in the last round. Nakamura - Carlsen encounter of yesterday, as well as Aronian - Kamsky duel, was drawn. "I didn't even prepare for the game," Chessvibes quotes Nakamura. "I didn't want to play anything crazy." As it turned out this was the shortest game of the tournament. Tal Memorial: Back To Super-GM Format? The US Champoionship among men and women started in St. Louis. The men's tournament consists of 24 participants who will compete in 9-round Swiss. 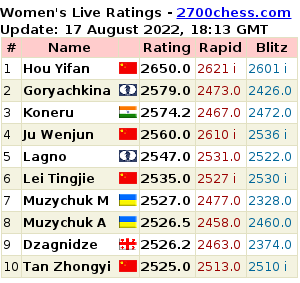 The rating favourite is GM Gata Kamsky. Another participant of the recent Grand Prix stage in Zug GM Hikaru Nakamura is not participating. The women's section is traditionally held in round-robin format. Traditional favourites are Irina Krush and Anna Zatonskih.